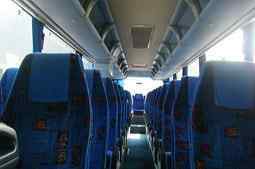 If you are looking for great minibus and coach hire in Nottingham check-out Nottingham Minibus Hire. We have provided the good citizens of Nottingham and the surrounding area with exemplary service for many years and regularly receive fabulous feedback from customers who have had a smashing day out in one of our vehicles. Knowledgeable staff that are good with people are crucial to any customer-facing business and these two factors are at the core of our recruiting strategy. Our trained customer service agents really do put the customer first and spend time making sure they book the best vehicle for their group. A driver who has mastered the road network both in and around Nottingham and further afield and who can steward the liveliest of outings is a major asset to any minibus or coach outing. The drivers we recruit fit this description, what is more, they are all local people who live in and around Nottingham. We know how much customers appreciate a minibus or coach that arrives to collect them, gleaming on the outside, valeted inside and mechanically sound and we work hard to make sure our vehicles are despatched in this condition. 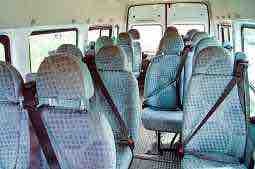 In our fleet of minibuses we have a Mercedes 16 seater, Volvos and Ford Transits. When more than 16 are travelling we highly recommend our Iveco Coaches. We introduced on-line booking through our Internet site and this has proved very popular. Complete the form, tell us about any special requirements you have, such as, luggage or equipment you will be carrying, and mail the booking form to us. Should you prefer, ring our booking line and speak to one of our agents. They will help you decide the best option for your party. Our estimates are fully inclusive and sent to you within half an hour of agreeing your package. Where ever and when ever you want to go a minibus is a great way for you to get there and back. We regularly take customers to the airport to catch their flight and collect them when they return. First-timers always tell us how surprised they at how effortless the process is and far better than struggling with airport traffic, parking restrictions and exorbitant charges. If we are collecting you on your return we follow your flight schedule and if your plane is going to be late landing we adjust our collection time to take account of this. in mind. Travellers benefit from reclining seats, tinted windows, entertainment systems and Wi-Fi. 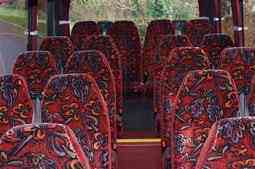 We have coaches that seat from 18 to 72. If you want to tour, perhaps over a weekend or even longer, speak to us and we will put together a touring schedule for you. Nottingham is ideally placed for lots of fun days and evenings out. Take your 6-11-year-old group to Gulliver’s Kingdom at Matlock, or arrange a trip for teens and young adults to Alton Towers; its only 50 miles. If you are a party of active-retired people why not visit Chatsworth House. Sometimes our drivers drop walkers off in the Derbyshire Peak District and arrange to collect them at the end of their exertions. Perhaps a trip to historic Lincoln would suit your group. There are so many places to go and things to do and a minibus is a great way to turn your ideas into a reality. Nottingham is a city in the East Midlands with a population of 311,000; 730,000 when the wider urban area is taken into account. Nottingham postcodes begin with NG. Historically Nottingham is associated with Robin Hood and the Castle, which dates from 1068, was a stronghold of Prince John during the reign of Richard I. The Industrial Revolution saw Nottingham develop as a centre for textile production, particularly lace making, although this declined following WWII. Nottingham today is a thriving city with many large companies basing their headquarters there. These include among other, Alliance Boots, Chinook Sciences, and Pedigree Pet Food. The city is also home to the National Ice Centre, the National Water Sports Centre and of course the test cricket venue of Trent Bridge. There are plenty of opportunities for shopping too at the Broadmarsh and Victoria Shopping centres, The Exchange Arcade and Flying Horse Walk. The Theatre Royal is a major entertainment venue, Chitty Chitty Bang Bang is playing in May and Derren Brown brings his latest show to the theatre in July. Nottingham Arena with a seating capacity of 10,000 is a major music venue and is hosting Disney on Ice in May and the legendary rocker Rod Stewart in June. At Nottingham Minibus Hire we guarantee to go the extra mile for you. Contact us today.